Specialty counter being cut at Gallant Mill. In late 2004, work began on a major expansion of our sawmill. 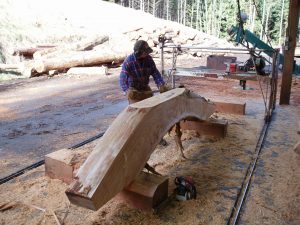 In partnership with Gallant Enterprises of Maple Ridge, the mill opened in February 2004 and began cutting specialty beams and components for timber frame buildings which are rapidly gaining popularity around the world. Capable of producing planed timbers up to 30” wide and 64 feet long, the mill specializes in cutting specialty and value added materials. 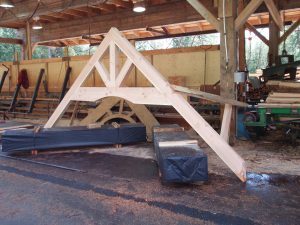 The mill consumed approximately 10% of MKRF log production in 2005 and supplied all timbers and finishing material for the Loon Lake Student Center, new dock and the Loon Lake Lodge. Total 2005 lumber production was over 500,000 board feet. For a list of products and services or to get a quote, check out their new web site at: https://gallant.forestry.ubc.ca/ or send an email at gallant.mill@ubc.ca.